Promessa founder Susanne Wiigh-Mäsak has developed an ecological burial process that allows the body to be restored to the earth as naturally as possible. Image credit: Promessa, Niklas Johansson. (PhysOrg.com) -- Ever since the 12th century, the most common way to bury the dead has been to lay the corpse in a casket and then bury the casket several feet underground. Since then, we have learned that casket burials cause environmental and health problems due to the fact that the corpses do not receive enough oxygen to quickly decompose into compost. Instead, the corpses undergo a slow rotting process by bacteria that feed on sulfur, and remaining products can harm the nearby drinking water. A Swedish company called Promessa Organic AB thinks there is a better way to lay the dead to rest. 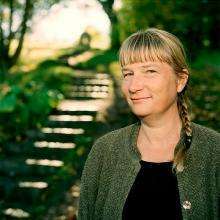 The companys founder, biologist Susanne Wiigh-Mäsak, has developed an ecological form of burial in which the corpse is transformed into compost in about 6-12 months. The organic burial process avoids embalming fluids and greatly reduces the environmental impact on the air, water, and soil. The first part of the ecological burial method involves removing the water that makes up 70% of the human body. To do this, the company freeze-dries the corpse in liquid nitrogen within a week and a half after death. The corpse is first frozen to -18°C (0°F) and then submerged in liquid nitrogen. Next, sound waves at a specific amplitude vibrate the brittle corpse, transforming it into an organic white powder. The powder is sent through a vacuum chamber that evaporates the water, greatly decreasing the corpses mass. If the person had metal surgical implants, a metal separator can remove these parts from the dry powder. If required, the powder can also be disinfected. Wiigh-Mäsak, who owns a greenhouse and grows 15,000 organic plants, had been thinking about the idea of an ecological burial for many years until she finally decided to develop the idea into a reality. The calm hours spent in my greenhouse gave me peace of mind, and it suddenly become obvious to me how human beings could also be fully integrated with the natural ecological cycle that we are an inherent part of, she writes on Promessas website. Promessa has won awards from the Green Organisation as well as received recognition from UNESCO for the environmental benefits of the Promession process. Currently, the company is building its first facility to offer ecological burial as an alternative to casket burial. The first Promatorium in Sweden should open in the spring of 2011, with additional facilities to follow in the UK and South Korea. I'm sure the answer is not as much, but what environmental damage, if any, is amassed from capturing, storing, and releasing liquid nitrogen? A key ingredient in this process. If the answer is none, then Great! If the answer is "much less" than still Great! Haha where do you think THAT comes from, magic pixies? Why go to the step of freeze-drying the corpse like instant coffee? Why not just bury the body in a shallow grave and let the worms do what worms do? Why go to all the trouble...just eat the corpse while it's still fresh...you cannibals! Have no dignity...will not give it either to the helpless and the dead! This is really sad! Sounds pretty zen to me, you can choose what you become after you die because your nutrients can be specifically used to feed something like a tree. I'd like to know what they do with the liquid they extract from you in the dehydrator, ever seen the remake of Heavy Metal? I've been telling people for years that I want to be mulched. Maybe I should add that it's after I die... Oh, and don't forget to add a fish. And then plant corn or something nice. My uncle often jokes that when he dies, he will let freeze himself and the undertaker will hammer him in the earth like a nail. But I think that this liquid nitrogen freezing burial is a good idea, although I think a "normal" burial as described by TheTim would be more ecological AND economical. Just remember.. When you go, take as many Conservatives with you as possible. Awesome... I love it when the mask falls away! Spoken like a REAL Leftist! Why not start with me, shipmate? wish i could take that down, i dont think that i'm thinking of the correct person.. so just negate that last comment..
Yah I guess I ate the troll bait. Still... what a friggin' moron. This lady is actually featured in the book 'Stiff' by Mary Roach. I think a small article like this is actually doing her a disservice. She's a bit out there, but there's a market for this, and it's not hurting anyone. TheTim's method is definitely more natural, however I don't see many people wanting the possibility of a heavy rainfall exposing their half-decomposed loved one to the world. They're making it far more complicated than necessary. I compost 200 to 1,600 lb corpses on a regular bases - we're a farm. After a few months all that is left is a grey stain. Very low tech. Very economical. No need for fancy freeze drying or other expenses. So why do they make it complicated? Follow the money trail. I have a much less complicated method of assisting the departed to find a new beginning. I also intend to use the method on my own journey to the other side, it involves readily available resources and is probably the most natural, simple, economical, and spiritual method that I have been able to find. The industry that has built up around final disposition of human remains dont want people to be practical in the disposition of loved ones. The obvious reason is Money if you fall on their doorstep with a blank check they will help you write it. Price for a Granite plank with message engraved on it about 11 X 14 inches $76 Total cost = $916. And if you place it in the yard you have a place to talk to the loved one.